12 December 2014 | It’s a short paragraph only 88 words in total. But these few words, nestled within a 1,603 page document, have laid bare the divisive politics behind conservation measures and big money. The $1.1 trillion spending bill, which just passed both the House of Representatives and the Senate, has included a small provision about the sage grouse. The sage grouse, a bird similar to pheasants, presents enormous challenges to conservation as the species range meanders through eleven Western states and cuts across various public property and lucrative oil and gas lands. While petroleum companies spend big bucks lobbying in D.C., the sage grouse has much more limited resources at its disposal. But there was one enormously powerful tool in its back feathers: the Endangered Species Act. Grouse habitats have declined significantly through the years, to the point where the Department of Interior (DOI) must decide whether or not to list the species as endangered by September 2015. This threat of the Endangered Species Act effectively clipped the wings of oil and gas ambitions, which has prompted the deferral of more than 8 million acres of sales of potential oil and gas leases on sage grouse land. All that has changed with the passage of the Congressional spending bill a few hours ago. The bill includes a provision to withhold funding for the Department of Interior to decide on the sage grouse’s endangered status. 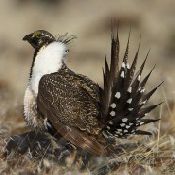 While mainstream conservationists balk at this Congressional rider, payments for environmental services practitioners cautiously view this as an opportunity to change the impeding conflict over the sage grouse. “The fact that Congress intervened in this speaks to the need for conservation programs that engage landowners and communities as a solution for endangered species rather than causing enough consternation that lawmakers intervene, Says Jeremy Sokulsky, CEO of the performance-driven conservation company Environmental Incentives. His company currently pilots two programs to save the birds. In Colorado, Environmental Incentives has teamed up with the Environmental Defense Fund to create the Colorado Habitat Exchange, which focuses on preserving sage grouse habitats through land management incentives to ranchers. Nearby Nevada has a similar pilot at the state level, which will similarly create quantified conservation outcomes (credits) and impacts from human activities (debits) to encourage overall conservation benefits. Though the threat of an Endangered Species listing helped motivate locals to participate, the pilots are already up and running. Now, what they really need is more time to monitor project outputs. In this sense, the delay can be an opportunity to quantify the project’s benefits and impacts. This could give payment conservation projects more leverage in the later Department of Interior decision. While FWS has experience with mitigation and conservation banking measures behind Environmental Incentives’ work, the Department of Interior does not: and it is ultimately up to the latter to decide on the fate of the sage grouse. “They [DOI] need to see it work before it can be given full or significant weight in the listing decision, Sokulsky said. Over at the Interior Department, Spokeswoman Jessica Kershaw had harsh words for the uninvited Congressional intrusion, but said that, in the long term, it will make little difference to the department’s conservation work regarding the sage grouse. With regard to the potential listing, the funding bill does not stop FWS from continuing to collect data and conduct analysis around a final decision, nor does it have implications for local and state plans or partnerships. Which means there’s yet hope for the chicken-sized bird and for incentivized conservation. Kelley Hamrick is an Assoicate in Ecosystem Marketplace’s Carbon Program. She can be reached at khamrick@ecosystemmarketplace.com. ← This Week In Forest Carbon: What Role Will Forests Play In Future Climate Deal?